Congratulations to Olivia and Andy Tan on the safe arrival of Henry, a baby boy. 3:- 1st Bob Triples inside. Last updated Sunday, 11 February 2018 at 22:32:33. First submitted Sunday, 11 February 2018 at 18:22:04 by Ian Redway. 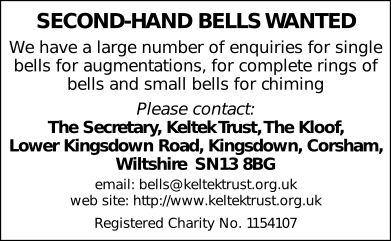 Sent for publication in The Ringing World on Sunday, 11 February 2018 at 18:22:18, and printed in one of issues 5575, 5576 or 5577.